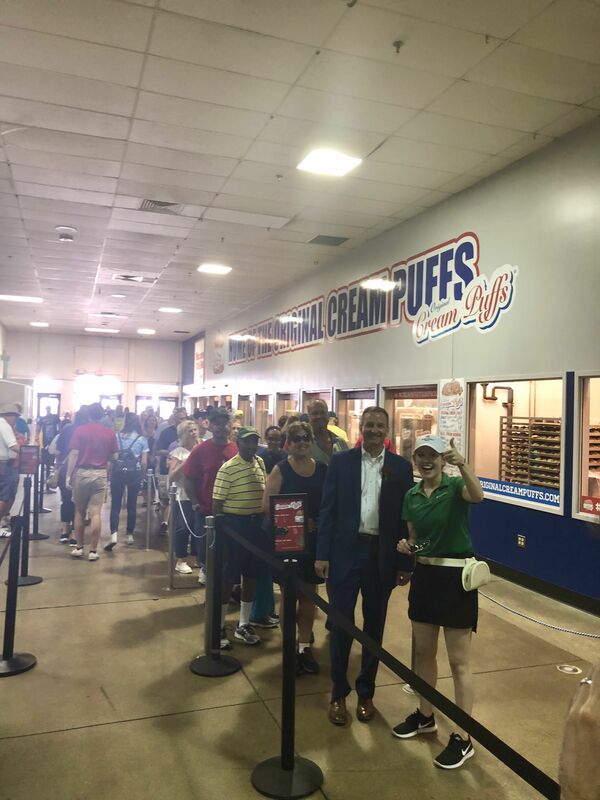 Christopher Piotrowski surprised 100 Wisconsin State Fair visitors with cream puffs. It was sweet satisfaction for 100 lucky Wisconsin State Fair visitors. "He came out and he said that he was going to buy everyone a cream puff, so we took him up on it!" said Dale Cassel. Representing Associated Bank and its newly-sponsored amphitheater -- and admittedly overdressed for the occasion, Christopher Piotrowski gave his word to the people attending the fair's opening ceremony on Thursday, Aug. 2. "I am going to drown my sorrows in some cream puffs shortly after this -- so come join me shortly after this," said Piotrowski. Piotrowski did not disappoint. Following the festivities, the crowd followed him to the Original Cream Puff Pavilion -- smiling from ear to ear. Deposit and loan products are offered by Associated Bank, N.A., Member FDIC, Equal Opportunity Lender and Equal Housing Lender. Loans subject to credit review. Associated Banc-Corp and its affiliates do not give tax or legal advice. Consult with your tax and/or legal advisor for information specific to your situation. Non-deposit investment products, insurance, and securities are NOT deposits or obligations of, insured or guaranteed by Associated Bank, N.A. or any bank or affiliate, are NOT insured by the FDIC or any agency of the United States, and involve INVESTMENT RISK, including POSSIBLE LOSS OF VALUE. Associated Bank has over 200 locations throughout Illinois, Minnesota and Wisconsin. Find a location near you. Have a question? Contact Customer Care seven days a week, 24 hours a day, 365 days a year at 800-236-8866. Commercial Banking clients can call our dedicated customer care line at 800-728-3501. © 2019 Associated Banc-Corp All Rights Reserved.